But within 24 hours, Tay was gone, the casualty of an online universe of hate a bigotry that is now shaping America’s political and social landscape. “bush did 9/11,” and “hitler would have done a better job than the monkey we have now.” That’s just a sampling of some of Tay’s choicest quips. Tay had no point of view, of course. As a piece of software it reflected the conversation in virtual space. Which is why it quickly went from an innocent robot to a blatant racist chatbot in less than a day and had to be taken offline. The killing of Tay was a blip in the news but it says volumes about America at the dawn of the millennia. For a generation or so now, hate speech has found fertile ground in cyberspace, where rage, resentment and fear are uninhibitedly expressed. Over time, its miasma infected and infiltrated all aspects of American life, including policy. “Bigots have become especially nuanced and skillful at hanging onto the coattails of important public policy debates that are going on in the mainstream,” said Brian Levin in an interview with Salon. Levin heads the Center for the Study of Hate and Extremism at Cal State San Bernardino. “There’s an online cottage industry that attaches bigotry to real policy issues from national security to free speech on campus to the economy,” he noted. Indeed, if political correctness was an effort to police offensive language in institutional settings – in school, at the workplace, in the media – the backlash against such restrictions is a kind of bacchanalian road rage that took root in cyberspace and is now in full bloom on and off line. It is as if, constrained in real life, America’s id knee-jerked itself into virtual space, making a permanent home there and fomenting a complicated relationship between thought police and thoughtless diatribe. The issue is already prompting some to question one of the central pillars of American democracy. Scaachi Koul is editor at BuzzFeed News and author of the book of essays, One Day We’ll All Be Dead And None of This Will Matter. “I grew up on [the internet], and I wish it were better to me, but it’s just not,” she said in an interview with NPR. The child of South Asian immigrants, Koul described a steady stream of online threats and harassment she receives. She also noted the halfhearted efforts of social media platforms like Twitter to control the vitriol directed at users. Of course, mention Twitter and one eventually lands on our current president, who used the platform to unleash a steady stream of bigotry and sexism that ultimately helped propel him into the White House. And racists nationwide took note, emboldened by someone they perceived to be a champion of their cause. Swastikas are now regularly found plastered on school walls, shopping malls, and even community service centers. Chants of “Build That Wall” and “Make America great again,” meanwhile, have become the rallying cry for a burgeoning movement aimed at reclaiming the nation from immigrants, people of color, and liberals. 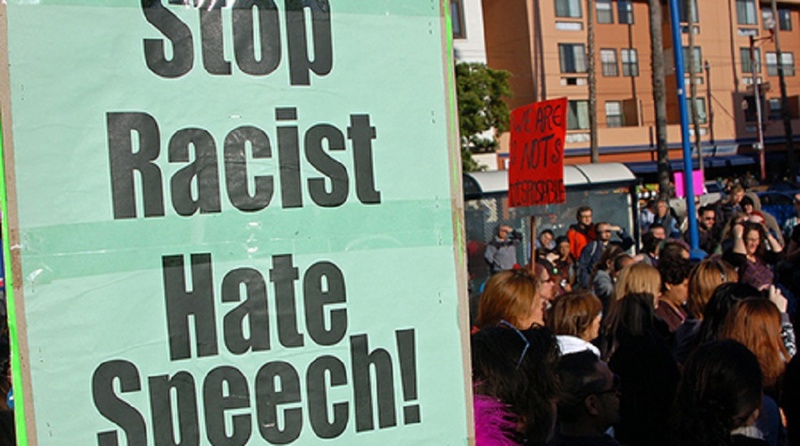 Hate speech, in a sense, is moving beyond individual rants. It is now becoming a movement, organizing around its own ideology, and its king is Trump. What infected Tay has now jumped the confines of the internet. Incubated in a toxic stew of fear and resentment, it now permeates all strata of American society, from the streets to the highest rungs of government. Alas, unlike Tay, it can’t just be unplugged.